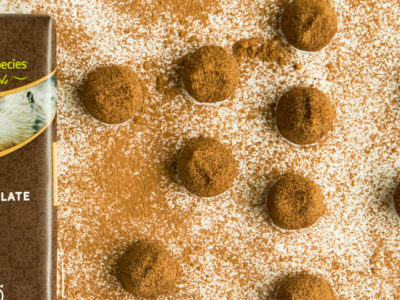 Let’s face it, chocolate goes well with pretty much everything. Fruits, pastries, pancakes and it can even pair with tofu and other proteins in the form of mole sauce. Chocolate’s versatility is thanks to its complex flavor profile and low melting point. At around 85 degrees Fahrenheit, you will begin to see chocolate melt into a warm, sweet liquid which can be drizzled on anything and everything. Melting chocolate is a simple process but it does require a special technique and a little patience. Even though chocolate is versatile (and basically the best thing on Earth) it is also fragile and can be easily burned. The best way to melt chocolate for drizzling is to use the double boiling method. Since chocolate can burn easily, this method keeps the chocolate separate from the immediate heat source so there’s less of a chance it becomes too hot, burns and sadly, becomes less tasty. Start by simmering water in a small saucepan. Remember not to get the water too hot. Place a heat proof bowl on top of the saucepan keeping it away from the water in the pan. The bowl should be around an inch above the water in the saucepan. While the bowl is on top of the saucepan, the increased pressure from the covering may cause the water to boil so you’ll need to keep an eye on the water to make sure it doesn’t boil over. As the chocolate melts, stir occasionally to ensure it heats evenly. Once most of the chocolate has melted, remove the bowl from the heat and the rest should melt from the residual heat. 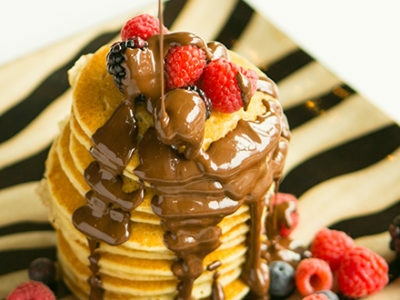 Finally, drizzle chocolate on your favorite foods and enjoy the happiness of warm, melted chocolate. Remove bowl from heat when a few small unmelted chunks remain (residual heat will melt the rest). Here’s a short list of the things we love to drizzle with melted chocolate but don’t let this stop you from trying chocolate on anything and everything. Feel free to get creative. In fact, tell us what you used this method for in the comments below!